I'm sure I've mentioned before that I teach Game design. Sometimes at my college we have guest speakers, and most recently my colleague managed to book Ian Livingstone. It led me to an interesting day. 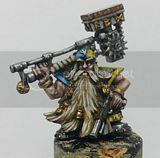 with the recent furore over pricing and corporate direction, and the move to resin instead of pewter, i found myself in a GW yesterday, looking at Yarrick and pondering weather to buy him in pewter, or wait for resin. I have a feeling i will miss the challenges and the heft of lead. but in the end I decided to wait and let him be my first finecast. 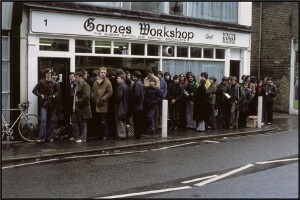 So fast forward and I'm watchin Ian livingstone start his presentation to out students and lo and behold he starts with his GW days, and shows us a bunch of photos of the first citadel miniatures facility. three men with beards and a few vulcanised rubber molds with a vat of boiling lead. I know he was there to talk about Eidos and the report he recently published to government and Lara and all that, but having a day where the current state of GW was on my mind, culminate in seeing one of it's founders show us it's begginings twanged a string for me. Where do I stand on finecast? I'll be happy to give them a go. but I've been playing with "little lead men" for nearly thirty years, so it's a tad sad that I wont have that feeling of weight anymore, more from nostalgia than practicality i think. Thirty years' worth of experience and a game design teacher... damn. Makes me pretty unworthy in comparison, and I harbor a crazy dream of writing a game on my own. Being a lawyer, it's easy for me to put content into well defined brackets - after all, sloppiness is the biggest sin a man who dabbles in legislation can commit - but way harder to think of actual rules I'd want to put on paper. Might I ask, whether there are any written sources one could use to educate himself on game design, or is the subject too arcane for any books on it to exist? I admit, I would be more than willing to find something to broaden my horizons. As far as books go, there are scores of them. how many of them have value? fewer. Most of the textbooks on the subject are quite dry, and go into theory about things that as experienced gamers we already instinctively know. What would be most valuable to read if one were thinking of writing a game system? that's easy. Other Game systems. read as many as you can, look at how people have done things, keep a notebook and jot down what works, what seems to convoluted. alongside this, jot down your own solutions to the problems and situations you see in the books. Well, I do have a healthy dose of respect for teachers of all branches. And thanks for the advice - I've skimmed through a dozen game systems already, and there's a treasure trove of ideas floating around the Internet. It's only the matter of committing myself to the task. Perhaps I'll have the temerity of asking you for a review some day.